This has been quite a year for noted actor and activist Shabana Azmi who was awarded the Padma Bhushan by the Government of India. She’s just finished Deepa Mehta’s ‘Midnight’s Children’ based on Salman Rushdie’s novel and is currently making a film with Vishal Bharadwaj. She has been chosen by TIME Magazine as 1 of 25 Asian heroes and is the only woman amongst four Indians on the list. Now comes her New York minute! 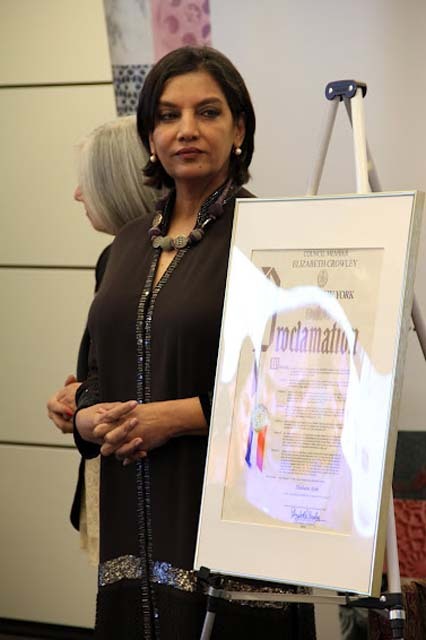 Shabana Azmi was presented a proclamation by New York State Governor Andrew Cuomo’s Office for Motion Picture and Television Development for her commitment to the arts and contributions to New York City’s film industry. 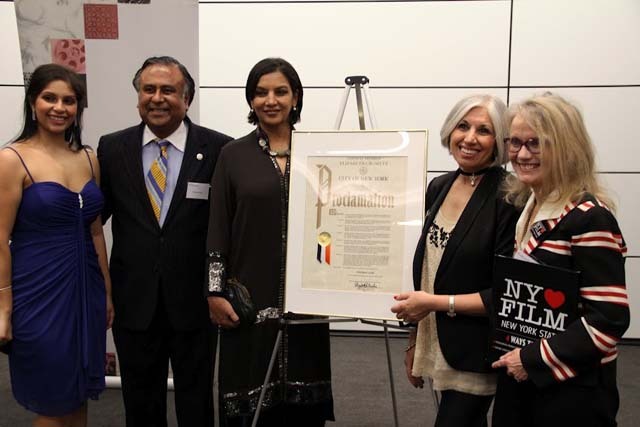 Pat Kaufman, Executive Director of the New York State Governor’s Office for Motion Picture and Television Development, gave an eloquent introduction of Azmi before presenting her with the proclamation. 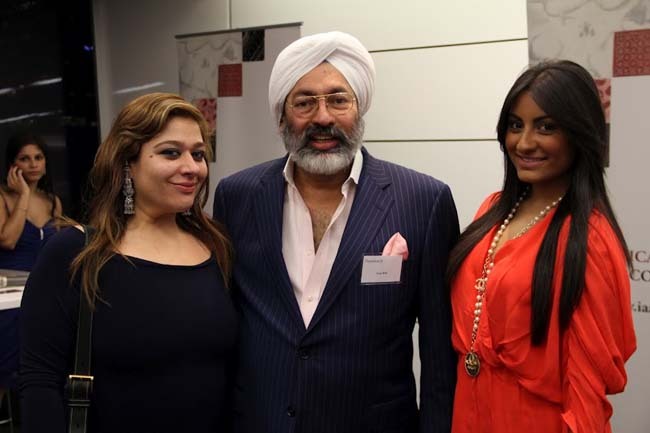 Azmi, who was honored as the chief guest at a gala event for AmeriCares the night before, is almost a New Yorker, since she comes in so often for her theater performances. 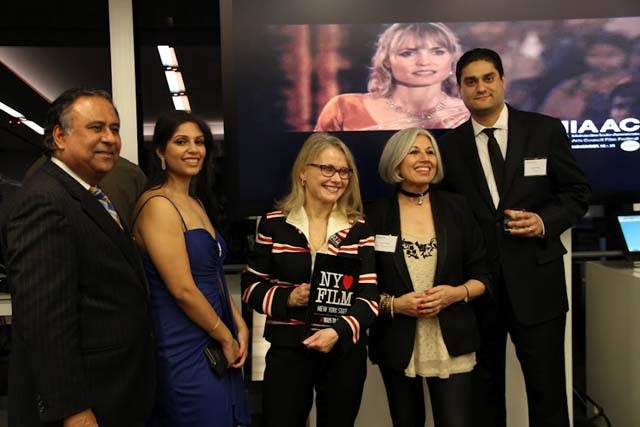 She also happens to be on the advisory board of NYIFF, and caring as she does for cinema, she turned the focus that night totally on the upcoming film festival in May, which offers a mix of independent, diaspora and art houses films. She traced the beginnings of the NYIFF, which started out showcasing films from within the Diaspora and then created a space for itself where besides independent and art house films, even mainstream cinema and regional films have started getting visibility and a larger audience. For global thinking Shabana Azmi, New York is yet another hometown and she seemed happy to be here, amongst friends, with the proclamation from the State of New York right behind her, and the glittering city waiting outside the picture windows.